Today's CEO change is too little, too late for the ailing retailer. J.C. Penney (NYSE:JCP) announced yesterday that CEO Ron Johnson was stepping down from the helm of the beleaguered discount retailer, naming former top executive Mike Ullman to take his place and return to the position he held from 2004 until Johnson's hire in 2011. In response, the shares fell more than 12% today, extending a decline that has lopped 60% off J.C. Penney's stock price in the past year. Despite the rising chorus of calls for Johnson's ouster, investors clearly agree that J.C. Penney's move today isn't the right answer. Here are three reasons why. 1. Meet the new boss -- same as the old boss. Trying something new only to have it fail is always discouraging. But it's even more discouraging to see a company choose to throw away the entire past year and a half without learning any lessons from its failure. To understand how big a step backward this is for Penney, you have to go back to 2011. At the time, it was struggling, having plunged like most of its peers during the financial crisis and then getting left behind in the economic recovery that lifted shares of most of its rival retailers. Activist investor Bill Ackman, who argued for a shakeup in J.C. Penney's management, noted repeatedly how Ullman failed to manage the company well and gave investors dismal share-price performance. It's hard to believe that the best the company could do for leadership was to bring Ullman back. If he chooses to ignore the hard-won lessons that Johnson helped J.C. Penney learn, then it'll be hard for investors to have any confidence that the retailer is likely to find a path out of its troubles. 2. Turning back isn't an option. Some investors likely believe by now that they'd be better off if J.C. Penney had never strayed from its coupon-and-discount model in the first place. Even if they're right, the company can't assume that by returning to that model now, customers will come back. Once-loyal customers who felt betrayed by Penney's strategic shift largely fled to competitors. Some stepped up to upscale retailer Macy's, which has seen a real revival in its business over the past year. Others likely went to fellow discounters TJX and Ross Stores, both of which have executed very well by offering name-brand merchandise at deep discounts to normal retail prices. For Penney to try to win those customers back would take a huge investment, and even then, having been burned once, they'll never have the same loyalty they once had to the retailer. Source: Retail Industry Total Return Price data by YCharts. 3. Big-box retail is on its way out. As if it weren't bad enough that its competitors have benefited from its woes, J.C. Penney has to deal with the longer-term trend that has threatened not just it but big-box retail in general: the rise of the Internet. Given the competitive advantage that online retailers have in avoiding the sizable overhead involved in maintaining stores, inventory, and staff, J.C. Penney would have faced a challenge even if it had remained healthy. To expect a second-time CEO to come up with a viable strategy to compete against peers with physical stores and against online companies without them is too much to expect. 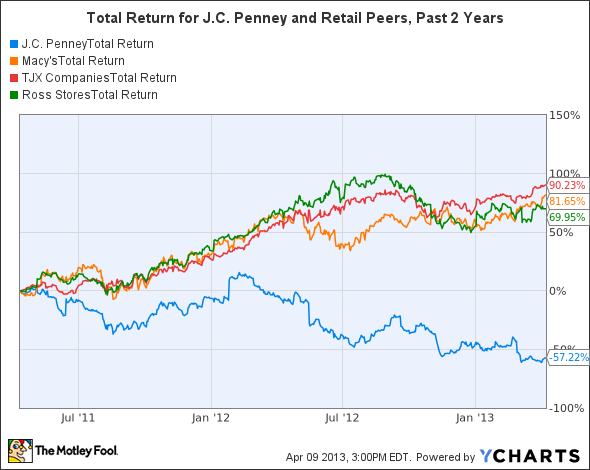 Even if J.C. Penney eventually goes out of business, that doesn't mean that the stock is a must-sell at beaten-down prices. Ackman and other interested investors will inevitably take steps to extract as much value as they can from the retailer. But J.C. Penney will never return to its former glory unless it shows a previously unseen ability to develop a compelling strategy to appeal to shoppers, and that seems extremely unlikely at this point.